published by Spartacist Publishing Co.
We publish the Inter­na­tional Secretariat’s initial circular to all sections of the Fourth Inter­na­tional on the “Tito affair,” as well as the two “Open Letters” which the Inter­na­tional Secretariat addressed to the Yugo­slav Communist Party in July 1948. The leaderships of both the French and British sections of the Fourth Inter­na­tional opposed the accom­mo­da­tion to Tito reflected in these Open Letters. We publish one docu­ment from each of these oppositional currents: a resolution adopted by the Fifth Congress of the French Parti Communiste Inter­na­tionaliste, held in July 1948, and a letter by British Rev­olu­tion­ary Communist Party leader Jock Haston to the Inter­na­tional Executive Committee, undated but written some time in the late summer of 1948. Those who wish to pursue further study of the docu­mentary record are directed to the many sources cited in the text. In the 1970s the American Socialist Workers Party reproduced many of the most important docu­ments from the history of the Fourth Inter­na­tional in its Education for Socialists pamphlet series, which is still in print; many docu­ments reprinted in the Education for Socialists series are cited in the notes. Much docu­mentation is available in French in the four-volume series edited by Rodolphe Prager, Les congrès de la IVe Inter­na­tionale (manifestes, thèses, résolutions), published in the 1980s by La Brèche-PEC. Where a French-language source is cited in this bulletin, the English translation was provided by the library staff. 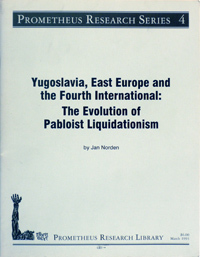 “Yugo­slavia, East Europe and the Fourth Inter­na­tional: The Evolution of Pabloist Liq­ui­da­tion­ism” was originally prepared as a contribution to dis­cus­sions between the Inter­na­tional Communist League (Fourth Inter­na­tionalist) and the Partido Bol­che­vique por la Cuarta Internacional (PBCI) of Argen­tina. It was published in the ICL’s Inter­na­tional Discussion Bulletin No. 30 (October 1992) as part of the dis­cus­sion for the Second Inter­na­tional Con­fer­ence of the ICL, which was held in the late autumn of 1992. At the ICL con­fer­ence, a panel dis­cus­sion on “The Fourth Inter­na­tional and the Fight for the Continuity of Trotskyism” examined the rise of the revisionist current led by Michel Pablo which destroyed the Fourth Inter­na­tional in the early 1950s. Comrade Jan Norden, a member of the Central Committee of the Spartacist League/U.S. and of the Inter­na­tional Executive Committee of the ICL, traced the evolution of Pabloism in the flawed response of the Fourth Inter­na­tional to the Yugo­slav Revolution and the 1948 Tito-Stalin split, while other panelists examined the influence of the Algerian independence struggle on the development of Pabloism in France, and the history of liquidation of the German Pabloists into the Social Democracy in the 1950s. The con­fer­ence mandated the early publication of Norden’s docu­ment, which represents a significant extension of our 1972 Spartacist article “Genesis of Pabloism.” “Yugo­slavia, East Europe and the Fourth Inter­na­tional: The Evolution of Pabloist Liq­ui­da­tion­ism” assumes a knowledge of “Genesis of Pabloism,” which is included in this bulletin. Based on the dis­cus­sion at the ICL con­fer­ence and in preparation for its publication as Prometheus Research Series No. 4, “Yugo­slavia, East Europe and the Fourth Inter­na­tional: The Evolution of Pabloist Liq­ui­da­tion­ism” has been revised and portions of an 8 August 1992 letter to the PBCI incorporated into it. The notes have been expanded to reflect the exten­sive docu­menta­tion assembled from French- and English-language publications of the Fourth Inter­na­tional, as well as from archival sources. We are not able to reprint in this bulletin a representative selection of the docu­mentary record cited. We have included a few items from the early period imme­di­ately following the June 1948 announcement of the Tito-Stalin split, because most of these are not readily available in existing docu­ment collections.